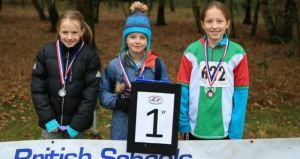 The 2016 British Schools Championships was held at Sutton Park, Sutton Coldfield, on Sunday 20 November, and hundreds of juniors competed, from schools from far and wide. The terrain is gently rolling deciduous woodland with an extensive path network. Maja Robertson came 2nd in the Year 5 Girls class, respresenting Longniddry Primary School – congratulations! More information about the event, including the results, is available on the BSOC 2016 page of the British Schools Orienteering Association website. Maja and family also competed at the Oxford City Race on Saturday 19 November, where Maja won the WYJ (Women’s Young Junior) class, and Calum came 5th in MYJ (Men’s Young Junior). For full results and more details about the race, see the Oxford City Race 2016 page of the Oxford University Orienteering Club website.